This is great for memory books and scrapbooks. This interview has 11 questions for your child to answer and space for a 4×6 photo. There is a printable for every grade. What a great way to look back at the interviews and see how much your child has changed! 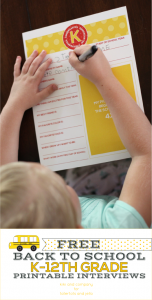 Click here to get this FREE Back To School Interview Printable from Tatertots & Jello.